From Software’s Souls games and Bloodborne have online co-operation, but some areas become more abandoned as time goes on. Return To Yharnam is a community event set to start on March 10th that’s working to revitalize Bloodborne’s online world of bell-ringing hunters. Demon’s Souls, the Dark Souls franchise, and Bloodborne all have the same general conceit about co-operative play. You put down a sign or you ring a bell, and some other player from another space and time will come to help you with that next area or boss you are in. However, these moments become rarer as the lifetime of the game goes on and players either lose interest or crowd around the same few popular summon spots in the games. Reflecting similar events that run for those other From Software games, Return To Yharnam is an event organized by the Bloodborne community that’s trying to get as many people playing the game as possible. Following the game’s inclusion as a Playstation Plus game for March, the event is specifically attempting to breathe new life into the game for old fans while populating the world of co-operative play for new players. They’re best friends, but they’re having a disagreement. When I played Darks Souls through for the first time, a helpful onion knight by the name of Sando appeared and absolutely annihilated Ornstein and Smough for me. I remember that so clearly and vividly, and people who were watching me stream the game still talk about Sando from time to time. Online connectivity is huge for From Software’s action franchises, and it creates truly unforgettable moments. 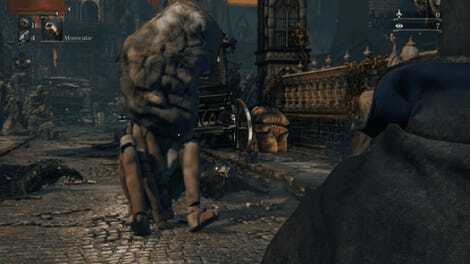 Where are those kind of moments going to happen in Bloodborne during the event? I asked illusorywall to give me some info on the hotspots of activity. 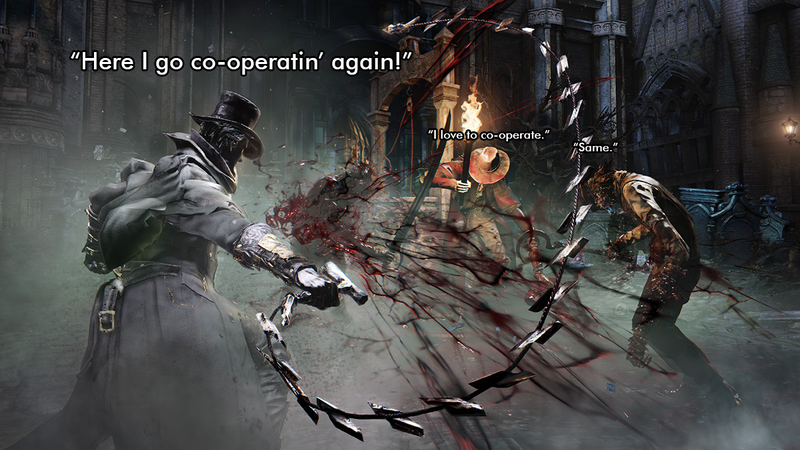 While I’m a big fan of jolly co-operation, it’s also undeniable that Return To Yharnam offers an opportunity to people who want to dig into Bloodborne’s player vs player combat, both in the form of honorable duels and in the form of the game’s invasion mechanic. If you want to hang out in the Nightmare of Mensis and fight opponents who are swarming around to invade you, this is going to be a great event. But new players should be forewarned that the Return To Yharnam event is going to make the likelihood that other players will invade and attack them much higher than it would be normally. I advise caution and a hefty dose of running away. I’ll definitely be there ready to use the clap emote at new players when they play the music box for Father Gascoigne on March 10th. The massive frenzy of Bloodborne play is roughly scheduled to end March 24th.